Out in support of their brand new eight album I’ll Be Your Girl, a weird and bold and synth-soaked departure from their more typically folk-informed indie rock sound, Portland staples The Decemberists, are, like clockwork, set to return to Nashville this weekend (they’ve played here three of the last four Aprils), this time across two nights, April 13 & 14 at The Ryman Auditorium, both with support from buzzy indie pop duo Tennis. A Decemberists show at The Ryman is always a stellar and essential affair, but with heir inspired new LP in tow, these dates promise to be extra special. Given the band’s hectic schedule the past couple of years, these also might be the last Nashville shows for a bit, should they choose to take a breather after this tour cycle. Tickets for both nights are still available here (4/13) and here (4/14), but there’s no guarantee they’ll last. Find out more about the shows below! 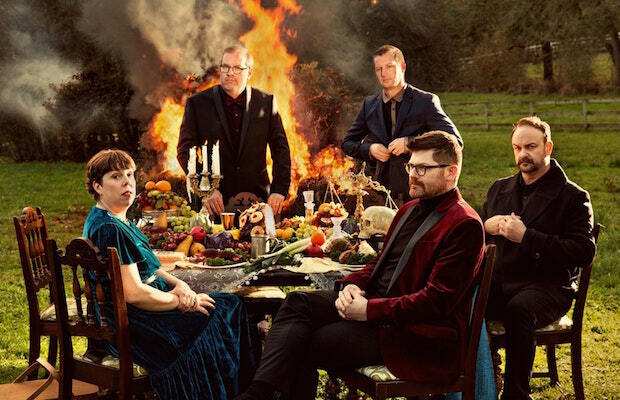 Formed nearly two decades ago in Portland, Oregon, folk and baroque pop soaked indie rock outfit The Decemberists have, over many years, cemented their legacy as one of the smartest, most prolific, most enduring and endearing bands of modern era. Led by bookish troubadour Colin Meloy, the band established a knack for crafting poetic, imaginative, history-referencing, and layered songs with their fan-favorite debut, 2002’s Castaways and Cutouts, and have largely built on that foundation with their numerous EPs and LPs that followed, adopting a wide range of traditionalist instrumentation, wavering between self-reflective and story-driven songs and outright concept albums, and managing to explore new depths of their wide-ranging influences without straying so far as to become unrecognizable. That is, until their brand new eight album I’ll Be Your Girl, which, save for Meloy’s unmistakable voice, contains several songs you’d be hard-pressed to recognize as The Decemberists, eschewing their typical British folk or Americana informed indie rock base in favor of straight up synth-driven new wave and post-punk, inspired, apparently, by the 2016 elections and the current dismal and weird general state of the world. It’s a cool and adventurous move for the band, who’ve always managed to evolve and keep their style fresh, and given their reputation for being an engaging, participatory, and esteemed live force, we imagine the new tunes will incorporate quite well with their extensive back catalogue. Though they’ve been making it to Nashville pretty dependably lately, the group might be due for another breather soon, so we’d recommend catching them now while the new record’s hot! Husband-wife duo Tennis sprung to acclaim with their 2011 debut, Cape Dory, written on and inspired by an eight month sailing expedition on the Eastern Atlantic Seaboard, which they embarked on shortly after graduating college (where they met). Seven years, three full-lengths and a few EPs later, and their latest album, last year’s Yours Conditionally, brought the group full circle, crafted during a four-month sailing excursion in the Pacific, self-produced, and released through their own label, Mutually Detrimental. Based in Denver, the band combine a knack for crafting dreamy, lo-fi indie pop with a retro, ’70s-laced pop and soul, creating a timeless effect and hypnotic sound, propelled by singer Alaina Moore’s gorgeous voice, honed even more recently by a brand new EP, We Can Die Happy. Beloved by critics, the duo have appeared at festivals like Coachella and Forecastle, on late night programs such as Conan, Letterman, and Leno, and on stage with the likes of Haim, The Shins, and Spoon, among others. A remarkable, unique, and prolific band, they’re a must-know fixture in the indie scene, and a perfect choice to open these shows. The Decemberists and Tennis will perform Friday, April 13 and Saturday, April 14 at The Ryman Auditorium. The shows are all ages, begin at 8 p.m., and tickets are available to purchase for $32.50-42.50 here (4/13) and here (4/14).